This is a truly fabulous 3-bed, luxury apartment in a great location in the heart of Cannes. 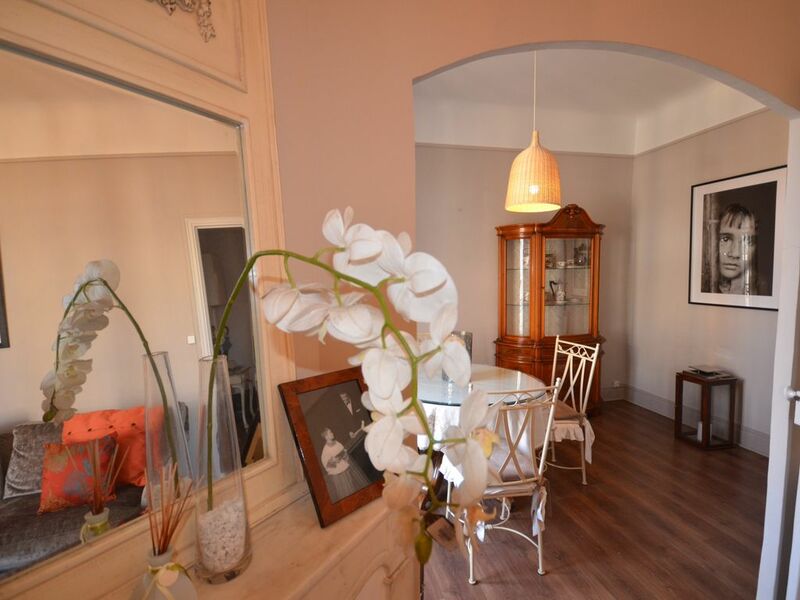 The apartment is situated in a historical, Parisian style, period building. The property has high ceilings and there are large double doors leading onto the balcony from each of the front rooms. It is a really bright apartment, and you can enjoy the sun in the afternoon and evening on the balcony. The apartment is on the 3rd floor, in a building with no lift. There are three bedrooms, one double bedroom, one with two single beds and one with two bunk-beds. There are two full bathrooms. The kitchen is fully equipped to a very high standard with fridge/freezer, cooker, oven, microwave, washing machine, dryer and dishwasher. The apartment provides quality furnishings and modern luxuries yet retains a period feel. This apartment is a stylish, comfortable, perfectly located base for a great stay in Cannes, year round. The apartment has been beautifully restored and redecorated recently and is a wonderful location to enjoy all that Cannes has to offer. It is a 6-minute walk to the beach and just 3 minutes’ walk to Rue d’Antibes (the main designer shopping street). It is close to the daily market place at Forville and also to the restaurants and bars in the Suquet/Old Port areas. Tall ceilings with double doors in each room making the whole apartment light and airy. Period features thoughout with newly restored French wooden window shutters. By booking through me you forgo the expensive agent fees. I have a manager for my apartment who lives in Cannes, who will prepare and greet you with the keys. She will also be your point of contact should anything go wrong with your stay. This apartment is superbly located, just 300m from the Palais des Festivals and the Croisette. Whether you are attending one of Cannes' many conferences or on holiday, you will want to be at the very heart of the action. The apartment is only minutes away from Rue D'Antibes, famous for its shopping. Nearby you will find wonderful restaurants and bars, shops, bakeries and much more. Life in Cannes centres around the world famous Croisette, the most elegant seaside promenade in Europe. Flanked by clear blue skies, golden beaches and perfect lines of striped parasols on one side and stately palms on the other.